Offices can become cluttered with paper. Documents can get lost, stolen, destroyed, become difficult to find, and sometimes, never to be retrieved again. GO PAPERLESS with a document management system. 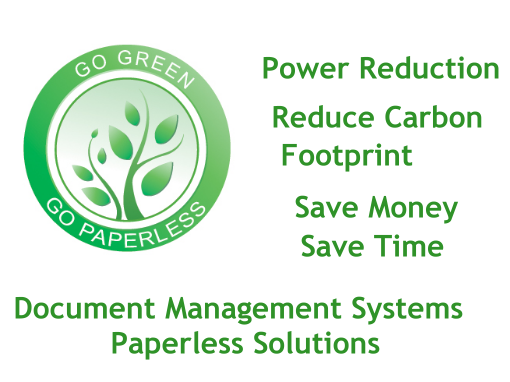 However, there is more to going green than just implementing a document management system and saving the printers from overload! Lighting, energy usage, plants, computers sleeping, thermostat controls, and many others. We will always strive to help our clients in any way we can for the pursuit of becoming green. By greening your desk, cubicle, office or entire building with plants you will all have cleaner air to breathe. Plants absorb indoor air pollution and increase the flow of oxygen. Deck the office out with plants for a cleaner and greener office for all. Adding a green aspect to the office equation along with making team members more aware of their environmental actions, may also add to their work ethic through paying closer attention to the decisions and details in ones life. It can create a sense of purpose for employees through activities such as creating a Green Team to generate creative ideas for reducing consumption and waste in the office.